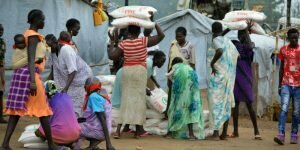 April 4, 2017 (SSNA) — Impending famine in South Sudan is major news, and has been reported in appropriately urgent fashion, including several recent stories in the New York Times, as well as by a number of other important news organizations. South Sudan has a population of approximately 12 million. Almost entirely unreported are the many locations in Sudan, with a population of almost 40 million, where there are severe food shortages, where malnutrition indicators are skyrocketing, and where famine also threatens in some locations. These food shortages have been deliberately engineered by the governing National Islamic Front/National Congress Party regime in Khartoum. This is the same regime that was responsible for major famines in South Sudan during the long civil war (1983 – 2005), including the infamous famine of 1998 (see Human Rights Watch, 1998). For over a decade, a grim “genocide by attrition” has been a critical weapon in the broader genocidal counter-insurgency conducted by Khartoum against rebel forces in the Darfur region—once itself a major news story, but now completely unreported by Western news sources, despite extraordinary levels of violence and severe deprivation. In Darfur the regime has consistently obstructed, harassed, and denied access to humanitarian organizations seeking reach to areas of critical need, even for assessment purposes—and continues to do so for much of the region. The regime regards this assault on relief efforts as a way of weakening remaining Darfuri rebel groups, even if it comes at enormous cost in the form of civilian suffering and destruction. Some three million Darfuris remain displaced from their homes—in camps for displaced persons, in host communities, in eastern Chad, or in what the UN calls “Internally Displaced Persons (IDP) Gathering Points,” locations of displaced persons without shelter or organized relief (see “Internally Displaced Persons in Darfur: The invisible catastrophe, international complicity,” March 19, 2017 | http://wp.me/p45rOG-21N/). These people are unable to return because of ongoing violence and insecurity orchestrated by Khartoum’s army and its various regular militia forces, most brutally and efficiently by the Rapid Support Forces (RSF). The number of irregular Arab militias forces—little more than provisionally organized predators—appears to be increasing. The UN uses the same number—three million—in its estimates of the people in need in Darfur, including children suffering from Acute Malnutrition and Severe Acute Malnutrition (Sudan as a whole has a population of 5.8 million in need of humanitarian assistance according to a very recent assessment by the U.S. Agency for International Development) . These people depend on international relief efforts that are gradually collapsing. And the collapse may become precipitous if Khartoum proceeds with its announced plans to dismantle IDP camps and its determination to force the removal of the weak, poorly equipped, and badly demoralized UN/African Union peacekeeping force (UNAMID), which provides the minimal security allowing some humanitarian organizations to remain in Darfur. If UNAMID withdraws, so will the remaining international relief organizations. A decision about the future of UNAMID will be made in June by the UN Security Council. The international response to developments in Darfur has been weak, irresolute, and the U.S. role has been one of increasing abandonment. Indeed, in 2011—as violence was again beginning to escalate in the region, the Obama administration explicitly “de-coupled” Darfur from the major bilateral issue between Khartoum and Washington, trading counter-terrorism intelligence from the men who formerly hosted Osama bin Laden for a lifting of U.S. economic sanctions. In the last week of the Obama administration, the deal was consummated and sanctions were lifted. This is provisional, to be sure, but the Obama administration had already given credit to Khartoum for halting major military activities and for effecting what Obama’s UN ambassador Samantha Power called a “sea change” of improvement in humanitarian access in Sudan. Such a characterization was a patent falsehood, and acknowledged as such by the U.S. State Department, which nonetheless has offered no public correction. This falsehood was particularly pernicious, given the massive evidence of Acute and Severe Acute Malnutrition to be found not only in Darfur, but in two large rebel-controlled areas in southern Sudan, South Kordofan and Blue Nile States. In these areas Khartoum continues to impose a total blockade on humanitarian relief to desperately needy civilians. The “Two Areas,” as they are known, have suffered from this blockade since summer 2011; and while we no systematic malnutrition surveys are permitted by the Khartoum regime, numerous reports from the ground and occasional hit-and-run assessments make clear that both Acute and Severe Acute Malnutrition are growing and in some areas approach the levels that are typically designated as “famine.” In two locations in South Kordofan, Warni and Kau-Nyaro, 64 percent of households were reported last year as “acutely malnourished.” Ominously, this year’s harvest has been particularly poor. Food prices are skyrocketing, where it is available—and the traditional “lean season,” or “hunger gap,” has not even begun. What makes Khartoum’s “success” so appalling is that the world has watched and done nothing to compel the regime to relent. In February 2012, half a year after conflict had begun in South Kordofan and Blue Nile, the UN, African Union, and Arab League put forward a proposal for humanitarian access to provide relief to civilians in the Two Areas, including the many hundreds of thousands who had already been displaced by Khartoum’s relentless campaign of aerial bombardment of farms and villages. The rebel group, known as the Sudan People’s Liberation Movement/Army-North (SPLM/A-North), readily agreed to the proposal; Khartoum balked. And has continued to balk, renege, obfuscate, and lie through some fifteen subsequent negotiating sessions. Last fall an agreement seemed close, but again Khartoum followed its pattern of either reneging on what had previously been agreed or imposing new conditions it knows will be unacceptable to the SPLM/A-North. Despite this, and despite the regime’s five-year history of finding a way to say no to humanitarian access, U.S. Charge d’Affaires in Khartoum, Steven Koutsis, recently wrote a piece in the influential Sudan Tribune blaming the SPLM/A-N as the holdout. His historical memory is both flawed and remarkably short-term, extending back only to the failed negotiations of fall 2016. He says nothing about the past five years, during which the regime has avowedly done everything possible to prevent the international community from “cloning” Darfur in the Two Areas. Nor does Koutsis answer the most basic question: cui bono? Who benefits from the failure of negotiated humanitarian access? Certainly not the rebel forces or the civilians for whom they legitimately speak. It is Khartoum, having mounted a new “dry season” military offensive every year since fighting began in 2011, that sees a weakened and starving population as beneficial. A telling revelation appears in leaked but fully authenticated minutes from a meeting in August 2014 during which senior military and security officials in Khartoum speak of a plan to destroy the abundant sorghum crop in prospect—the staple food for people of the region. Recent serious divisions within the SPLM-North make resumed negotiations on humanitarian access very unlikely in the near term, even as Khartoum’s humanitarian embargo affects more and more civilian lives. It is critical that the international community shake off its lethargy, its indifference, and its absurd trust in Khartoum as a reliable negotiating partner on the issue of humanitarian access. The UN, the African Union, as well as other international actors of consequence—preeminently the U.S. and the European Union—need to demand full and adequate access for food and medicine to all regions of South Kordofan and Blue Nile, and an end to the abusive obstruction and intimidation of relief operations in Darfur. And there must be serious consequences threatened if Khartoum refuses to yield in allowing humanitarian efforts to save the lives of Sudanese civilians. Famine in South Sudan is an immensely important news subject. But in the absence of a concerted effort to secure from the Khartoum regime full humanitarian access for Darfur, South Kordofan, and Blue Nile, unreported and deadly malnutrition in places like Warni and Kau-Nyaro will proceed apace. Starvation is no less real because unreported.